Anatomy students learn about the skeletal system, where they examine bones and how the bones fit together to make up an entire skeleton. In addition, some course also explore bone tissue and how bone is formed, repaired, and even broken down to release minerals. The bone matrix is composed of cells called osteocytes that form rings. The cells are connected by tiny canals called canaliculi. 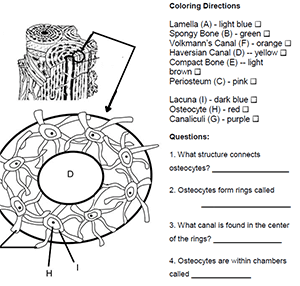 This worksheet shows these cells and then how the rings are stacked in compact bone. This worksheet was made for a senior level anatomy class.